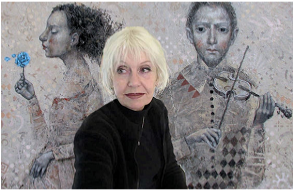 Ritva Voutila was born in Nokia, Finland. After finishing high school she studied art in Helsinki. In 1968 she moved to Australia, and then to Spain in 1971, where she continued perfecting her drawing and painting skills for the next ten years while working in fields as varied as garden design and computer programming and analysis. In 1981 she moved back to Australia, settling down in Sydney. For the next couple of years she worked as a computer sales representative, but in 1983 she became a full time freelance artist working initially in jewellery design, graphic design and advertising. Her first children's book, 101 Excuses for Not Doing Homework by Carly Little (Scholastic), appeared in 1990. Many other books followed. See Booklist. In 2015 The Stone Lion, illustrated by Ritva and written by Margaret Wild, won the Honour Book of the Year Award from The Children's Book Council of Australia (CBCA). Ritva is also an accomplished school performer and has held numerous art workshops. For 18 years she toured her school programmes throughout Australia to annual audiences of over 20,000 students. Twice (1999 and 2005) her show has won a Frater Award for Excellence in School performances from the NSW State Department of Education and Training. She lives in Ballarat, 100 km north-west of Melbourne, with her husband Richard. Illustrations for several magazines, newspapers and corporations in Australia and overseas. Her work features in many private collections in Australia and overseas. I am interested in human nature, human desires, disappointments, joys and sorrows and what it means to be human. I am often looking at these characteristics in the context of classic fairytales and folklore, because they are rich in symbolism shared by cultures around the world and through history. Classic fairytales have been around for centuries, but they are still as popular as ever. My aim is to raise questions about the relevance of classic fairytales in our modern society, and discover what are the core elements of human nature that remain unchanged through history even if some beliefs, moral values and codes of social conduct change over the years.